This was a long-term (28-week) extension of a short-term (24-week), randomized, double-blind, parallel-group trial of saxagliptin 5 mg once daily versus placebo as add-on therapy to open-label insulin or insulin plus metformin therapy totaling 52 weeks of treatment. In contrast with the goal of maintaining a stable insulin dosage during the short-term phase, during the extension phase the insulin dosage was flexible and adjusted as deemed appropriate by the investigator. The study was conducted in a clinical practice setting, including family practice and hospital sites. Patients with T2DM aged 18–78 years with glycated hemoglobin (HbA1c) 7.5–11 % on a stable insulin regimen (30–150 U/day with or without metformin) for ≥8 weeks at screening were included in the study. Patients were stratified by metformin use and randomly assigned 2:1 to oral saxagliptin 5 mg (n = 304) or placebo (n = 151) once daily. All patients who completed the initial 24 weeks of treatment were eligible to participate in the 28-week extension, regardless of whether they had required rescue treatment. The main outcome measure was change in HbA1c from baseline to week 52. In general, the outcomes achieved at week 24 were sustained to week 52. Adjusted mean change from baseline HbA1c at week 52 was greater with saxagliptin (−0.75 %) versus placebo (−0.38 %); the adjusted between-group difference was −0.37 % (95 % CI −0.55 to −0.19); between-group differences were similar in patients treated with metformin (−0.37 % [95 % CI −0.59 to −0.15]) and without metformin (−0.37 % [95 % CI −0.69 to −0.04]). At week 52, a greater proportion of patients receiving saxagliptin achieved HbA1c <7 % than those receiving placebo (21.3 vs. 8.7 %; between-group difference 12.6 % [95 % CI 6.1–19.1]). The increase from baseline in mean total daily insulin dose at week 52 was numerically smaller with saxagliptin (5.67 vs 6.67 U with placebo; difference, −1.01 U [95 % CI −3.24 to 1.22]). During the 52-week study period, the proportion of patients reporting ≥1 adverse event (AE) was 66.4 % with saxagliptin and 71.5 % with placebo, the majority being mild or moderate in intensity. The most common AEs (≥5 % with saxagliptin or placebo) were urinary tract infection, nasopharyngitis, upper respiratory tract infection, headache, influenza, and pain in extremity; the incidence of each AE was similar between treatment groups. In the saxagliptin and placebo groups, the incidence of reported hypoglycemia was 22.7 and 26.5 %, respectively; the incidence of confirmed hypoglycemia (fingerstick glucose ≤50 mg/dL [≤2.77 mmol/L] with characteristic symptoms) was 7.6 and 6.6 %, respectively. Adjusted mean change from baseline body weight was +0.8 kg with saxagliptin and +0.5 kg with placebo. Trial registration: ClinicalTrials.gov identifier: NCT00757588. The online version of this article (doi: 10.1007/s40261-013-0107-8) contains supplementary material, which is available to authorized users. Drs Barnett and Charbonnel recruited and treated patients, and all authors contributed to the analysis and interpretation of study data and the preparation, review, and final approval of the manuscript. All authors confirm that this paper is an accurate representation of the study results. Bristol-Myers Squibb and AstraZeneca funded the study and participated in the study design and collection, analysis, and interpretation of the data and review of the manuscript. 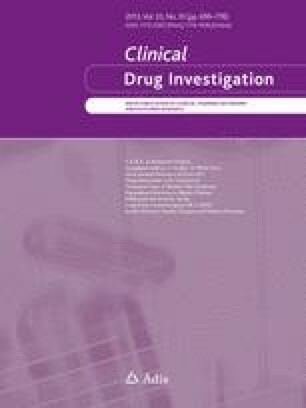 The decision to submit the manuscript to Clinical Drug Investigation was made independently by the authors. Medical writing support for the preparation of this manuscript was provided by Erica Wehner, RPh, and Nancy Sheridan from Complete Healthcare Communications, Inc. (Chadds Ford, PA, USA), with funding from Bristol-Myers Squibb and AstraZeneca. Karen May from Bristol-Myers Squibb contributed expertise and insights to the conduct of the study at every stage. Drs Li, Donovan, and Iqbal are employees of Bristol-Myers Squibb and have ownership of company stock. At the time of writing this manuscript, Dr Fleming was an employee of Bristol-Myers Squibb. Dr Barnett has received honoraria for lectures and advisory work as well as research funding from AstraZeneca, Bristol-Myers Squibb, Boehringer Ingelheim, Lilly, Merck Sharp & Dohme, Novartis, Novo Nordisk, Sanofi-Aventis, and Takeda. Dr Charbonnel has received fees for consultancy, speaking, travel, or accommodation from AstraZeneca, Bristol-Myers Squibb, Boehringer Ingelheim, GlaxoSmithKline, Lilly, Merck Sharp & Dohme, Novartis, Novo Nordisk, Roche, Sanofi-Aventis, and Takeda.